Beginning March 30, 2015, Assistant of New Testament Daniel Castelo guides us through the Romans Lectio series. Next up, Summer 2015: Selections from Israel's Story with Sara Koenig, associate professor of biblical studies. Listen to the podcast or subscribe to weekly guided Bible readings at spu.edu/lectio. Scripture is central to University Foundations classes taught by Seattle Pacific School of Theology professors, including Associate Professor of New Testament Studies David Nienhuis (left). 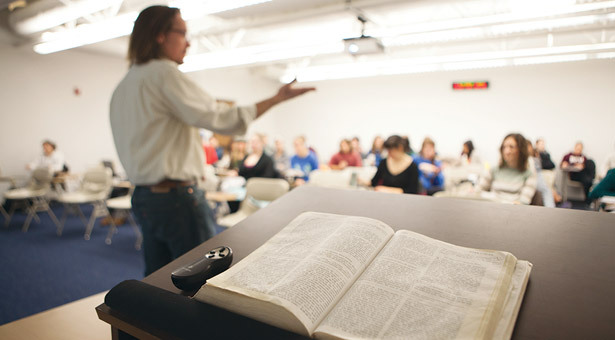 Right away, Sam Filby learned that University Foundations 2000 was no ordinary Bible class. During Autumn Quarter 2013, Filby and his classmates in UFND 2000 “Christian Scriptures” — taught by Robert Wall, the Paul T. Walls professor of Scripture and Wesleyan Studies — learned that they would be offering feedback on a work-in-progress authored by the faculty of Seattle Pacific. 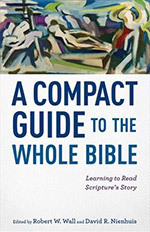 A Compact Guide to the Whole Bible (Baker Academic, 2015) is a small book that meets a big need — not just in SPU classrooms, but in schools, churches, and homes. In their introduction, co-editors Wall and David Nienhuis, associate professor of New Testament studies, write, “What could be worse than a biblical studies course that spends all its time teaching readers about the Bible but never creates space for a deep, extended encounter with it?” With the Compact Guide’s thorough and succinct introduction to the Bible, they’ve developed a way of teaching about the Bible that gives readers knowledge and confidence to encounter Scripture. “It was an opportunity to engage with that text, instead of just having an authority tell us what to think,” says Filby. Wall, Nienhuis, and their co-writers — Daniel Castelo, Laura Holmes, Sara Koenig, Eugene Lemcio, Bo Lim, Chad Marshall, and Frank Spina — sought to familiarize readers with the Bible’s nature, its canonical design as “a collection of collections,” and the Bible’s plotline, the whole story, from Genesis to Revelation. If students have both the nature and the plotline in mind, says Wall, they can interpret what they read with skill, and carry on a conversation about what they’ve read with friend and foe alike. “Part of our competence as Christians depends on our capacity to know the Bible well enough to take on those who are hostile toward Christian faith,” he says.